The trouble with country living: there’s nobody to hear you scream. 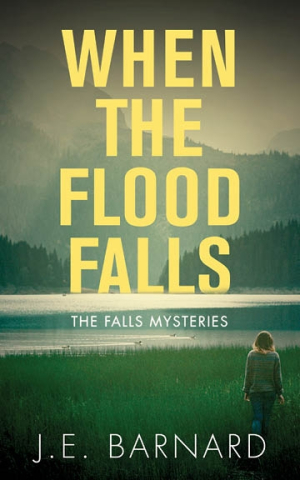 Lacey McCrae, a former corporal in the Royal Canadian Mounted Police, defends a friend from a nighttime stalker in the tense thriller When the Flood Falls. With themes of divorce, disability, and revenge, Flood pushes the limits on every page. The land west of Calgary, Canada, is filled with million-dollar views, mountains “coldly blue against the amber streaks of sunset, their jagged tops still partly shrouded in snow.” Still, Lacey and her friend Dee find that the gorgeous, remote wilderness is more than a high-altitude resort. Dee, in constant physical and psychological pain, is convinced that she’s being stalked by a dangerous stranger. Is it a real threat, or Dee’s imagination? Lacey, determined to defend her friend, is drawn into a tightening web. As her security skills are put to the test, Lacey also tries the limits of her friendship with Dee. In the deep woods, as snowmelt floods the region’s massive river, Lacey learns who—and what—she can trust. Lacey is a tough, fiercely written character whose values are at odds with the world around her. She’s often on the fence, “feeling as if her nose was pressed against the invisible barrier between cop and civilian.” Dee is an excellent foil, and their shared history illuminates the quirks and strengths of both characters. By keeping the focus on the women’s friendship, author J. E. Barnard has created a taut, high-stakes thriller that is deeply personal, internal, and psychological. When the Flood Falls is a surprisingly touching, heartfelt thriller that explores the wild territories of Calgary and the unsparing dangers within them.